Ever been in a dull, nine-to-five office job and had the urge to throw a paper aeroplane across the room? Or to see how long you can stand drinking at the water cooler before anyone notices you're not working? 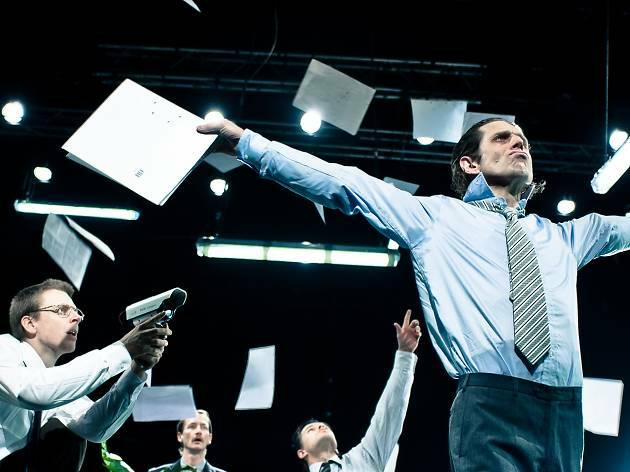 Denmark-based performer Kristján Ingimarsson and his physical theatre company Neander have tapped into those mischievous workplace urges in this bonkers dance piece Blam!. The show begins in a grey, open plan office, with four besuited workers tapping away idly at their desks. In the first moments there's evidence of rivalries in a few almost imperceptible movements – someone's pencil is stolen, a ball of paper is thrown at another's head, but when the boss isn't looking, things start to escalate. What follows is a silent, completely anarchic and sometimes breathtakingly silly re-enactment of several hero-fantasies, where the employees reinvent themselves as gun-toting, not-to-be-messed-with men and use stationary as their props. They create a jet-propelled robot from box files, a love interest in the shape of a water cooler and a CPR machine from office stamps. 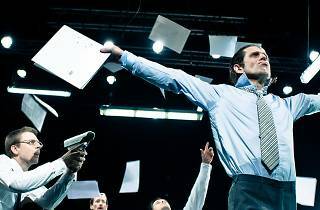 Cleverly, it's all choreographed by Ingimarsson to feel a little scrappy, so we still see the characters as hapless office workers. But the acrobatics are inventive to the point of being jaw-dropping. There's not a lot of grace, mind, but there is a lot of humour. Over the course of an hour, the rivalries grow, as do the fantasies, so that by the end, the pay-off is gloriously over the top and involves the entire office practically disintegrating in an insane climax that's unlike much else I've seen. It's true, the show smacks slightly of 'boys-with-toys', but when it's as fun as this, who cares? Running time: 1hr 15mins. No intermission.